All homes currently listed for sale in the zip code 90005 as of 04/18/2019 are shown below. You can change the search criteria at any time by pressing the 'Change Search' button below. "Dream no more... here it is! Elegant 1920's English Estate w/ Tennis Court located on one of the most prestigious streets in Historical Hancock Park. Set on a lush half acre lot surrounded by mature shade trees and landscaping, this rare and restored home comes complete with pool / spa, pool house and elevator with beautiful architectural features throughout. Spacious modern floor plan has a grand foyer w/ stained glass skylight, sweeping staircase and beautiful arches. The entry leads to a formal living room with a fireplace and large windows and then into a family / entertainment room with lighted floating bar. On the other side of entry is a lovely formal dining room w/ fireplace, has wainscoting and detailed crown moldings and large windows overlooking the front gardens . The large gourmet eat-in kitchen has center island and inviting fireplace. 1 bedroom down and 4 bedrooms up w/ spacious master bedroom has a fireplace and large master bath with huge walk in closet. 2 bedrooms have a Jack n Jill bathroom upstairs. Downstairs bedroom is maids quarters off laundry room. The basement holds mechanical support equipment for the home with extra storage for those seasonal items. Centrally located in exciting entertainment capital of the world this unique opportunity is yours for the taking. Come see for yourself this amazing, beautifully restored historic home in the prestigious Hancock Park community." 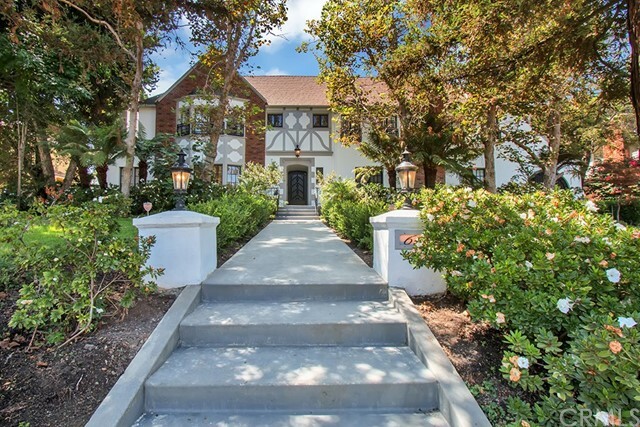 "Majestically positioned above the street sits this prime Hancock Park 1926 Mediterranean Revival home with a grand 2-story entry foyer colonnade on almost a half-acre of park like grounds, tranquil lawns and lush privacy hedges. Meticulously restored & remodeled, exceptional craftsmanship & authentic architectural detailing of the period, featuring hardwood floors, imported limestone and marble. The main floor offers spacious and grand living room with fireplace, dining room, family room, & office (or extra bedroom). The Gourmet cook's kitchen with breakfast room and Butler's pantry include marble counters, center island, Le Cornue stove/cooktop,and top of the line appliances. Upstairs level, with 4 large family bedrooms and the Master that includes a large double-winged bespoke walk-in closet and luxurious marble Master Bath. The rear grounds are an oasis of expansive lawns and hedges, a fabulous sky-lighted covered patio, separate guest suite and large converted entertainment space." "Location. Location. Magnificent Mediterranean mansion in the prestigious Hancock Park Area. Prime location to restaurants and entertainment, close to Miracle Mile, Beverly Hills, and Downtown L.A. This exquisite two-story single family home has 4,660 sqft of living space and lot size of 18,911 sq ft with 5 bedrooms and 5 bathrooms plus a solarium which has a view to an Olympic size pool with jacuzzi. Guest house includes 1 Bedroom + 1 Bathroom. Inviting manicured front yard greenery leads to a custom water fountain to a privately gated home. Huge backyard displays park-like serenity which can also host any outdoor party venues. Other amenities include a built-in Sub-Zero refrigerator and wine rack." "Astonishing transformation of this two-story Brookside traditional into a striking, design-forward showplace that exudes warmth, comfort and style. Every detail of this stunning re-imagining has been overseen with a meticulous eye, utilizing the finest materials and finishes. Rebuilt from the studs, the Mullen House has an open, flowing, light filled floor plan encompassing four bedroom suites, five bathrooms, a spacious living room, a double height great room with built-in bar, a chef's kitchen with 60 Viking range and 72 Viking fridge/freezer, a family room/den with panoramic glass doors opening to a sparkling new pool and spa in a landscaped back yard. The flex-space pool cabana/garage has a bonus second story. Smart home automation, custom ironwork and energy efficient systems are just some of the many additional features of this exceptional offering." "Announcing a stellar opportunity to buy into this phenomenal community of Hancock Park. 5 Bedroom, 3 1/4 Bathrooms. High celiings, large rooms and massive potential to update this gorgeous Colonial. Other amenities, heated pool and apartment above garage. All of this and more, nestles, in the heart of Los Angeles, mere minutes from DTLA, Hollywood, Mid Wilshire and surrounding neighborhoods. Call for appointment to show.. Located in the beautiful Brookside community of Hancock Park.3,750 sqft / 8,937 sqft lot / Built 1923 /5 Bedrooms / 3 1/14 Bathrooms / Hardwood Floors / Remodeled Kitchen / Formal Dining Area / Living Room / Family Room / Huge Master / Fireplace / Heated Pool / Covered Patio / Ample Back Yard / 2 Car Garage / Central A/COpen Thursday, April 18th, 11am to 1pmPlease contact me directly for more information." "The ADOBE in BROOKSIDE. 1-of-a-kind architecture on tree-lined Tremaine Avenue. Sprawling 9900+ lot surrounds this 1924 2-Story, 3000 Sq Ft property tucked away for privacy. 1st Floor: Gracious Living Room w/stenciled beams & wood-burning fireplace. Sunlit kitchen w/eat-in bar, Cesarstone counters, stainless appliances & farm sink. Adjoining den w/fireplace & tile floors. 1 bedroom w/French doors & full bath. Massive covered deck w/seamless flow from the inside creates an outdoor living space for lounging by the fireplace & entertaining. 2nd level: Master built in 2005 w/massive windows & views, custom closet space & master bath w/spa tub & glass shower. 2 additional spacious bedrooms, 1 with front-facing balcony, plus full bath w/period details. Hardwood floors, tons of windows, 3 wood-burning fireplaces, sconce lighting & many original details. Mature trees surround the backyard w/wide open space and plenty of room for a pool. 2-car detached garage & workshop w/windows." "This perfect remodeled and gorgeous house is in the heart of Hancock Park. It is in walking distance to the park and Ebell Theater. It is only minutes away from the freeway. The house has a lovely master suite with a spacious walk in closet and a beautiful bathroom. There are 3 bedrooms upstairs and 2 bathrooms. Downstairs, there is a guest room and a den that can be used as an office and there is a 1.5 bathrooms. The kitchen comes with a huge island and high quality, brand new stainless steel appliances. The house comes with a new roof, new windows, electrical, and plumbing. Almost everything is new. The wide backyard is like a park. The property is part of Windsor Village HPOZ." "Situated on a prime corner lot in character-filled HPOZ Wilshire Park, this extensively remodeled classic beauty has been revitalized head-to-toe. Light and bright with a flawless open floorplan, downstairs boasts a sun-filled living room, formal dining, inviting family room, and sensational kitchen. French doors open up to the backyard, sparkling pool, and patio. One bedroom and full bathroom also occupy the first floor. Upstairs is comprised of four bedrooms and three full bathrooms. Enjoy the master suite's soaking tub and dual closets. The jewel of the home, the finished attic space with peak-a-boo views of Downtown LA, is ideal for a home office or children's playroom. The charming curbside approach and delightful white picket fencing is sure to please those who appreciate traditional living just moments from Hancock Park and Larchmont Village. Welcome home." "The best of both worlds, this Mediterranean Renaissance Revival home has been recently remodeled but has maintained many of the original character details. Feel the grandeur of the 1920's as you enter the oversized arched front door. To the right of the front door is a window filled sunroom that leads out to a covered patio and to the left is an spacious living room with a decorative fireplace and a door leading to another private patio and the garden. Feast your eyes on the brand new expansive kitchen with engineered quartz countertops, white cabinets, Thermador range, built in refrigerator and microwave. One small bedroom and 3/4 bath complete the downstairs. Upstairs are three large bedrooms. The master bedroom includes a spacious sitting area and a private balcony. The other two bedrooms share a jack and jill bathroom with dual sinks and a covered balcony with newer wood flooring to enjoy a quiet retreat in the middle of the bustling city. The lush backyard has many exotic plants. Additional features include detached garage with storage room and a California basement. This home is located in the Windsor Village - Historic Preservation Overlay Zone"
"Located moments from Hancock Park and Larchmont Village in picturesque HPOZ Wilshire Park is a reimagined transitional Spanish Colonial masterpiece. Thoughtfully designed for the most discerning buyer, the home is a masterful blend of preservation and reinvention. Hand-selected antique light fixtures collected from all over the world and designer finishes create an unparalleled soulful ambiance. The refined formal living room features the home's original Batchelder fireplace. Formal dining room, family room, office, bedroom, and bathroom also occupy the first floor. Three bedrooms and three bathrooms occupy the second floor. The crown jewel of the home, the master suite, features peak-a-boo views of Downtown LA, a generous sized custom closet, and exquisite bathroom outfitted with clawfoot tub and separate shower. The expansive finished basement is a blank slate waiting to be transformed into an art studio, children's playroom, or home theater. Welcome home." "Price Adjustment - Now less than $359 per SF. Located just S of Wilshire Blvd in highly coveted Wilshire Park HPOZ. This large modern residence has been re-imagined and upgraded w/new lighting, new floors, fireplace, apx 10 ft vaulted ceiling downstairs, huge gourmet kitchen with center island and over 5,000 sf of living area per tax assessor. 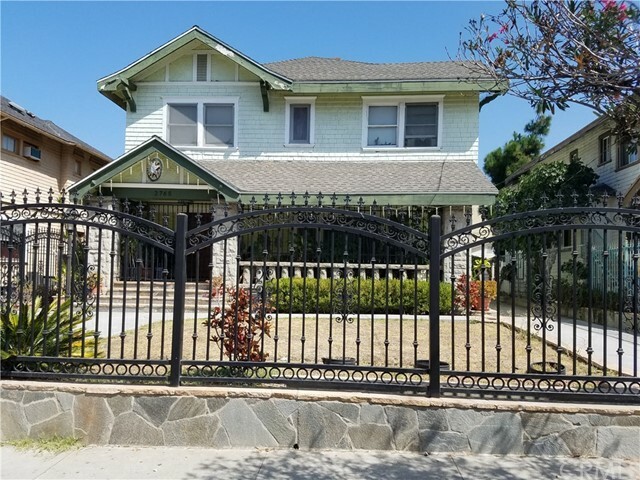 Enter into the enormous double living room with separate conversation areas, formal dining room and remodeled kitchen with brand new SS appliances leading out to the backyard patio area. Downstairs offers 2 bed + 2 bathrooms. Upstairs are 5 bed + 3 baths including a sumptuous Master Suite with huge walk-in closet, soaking tub and seamless glass stall shower, an open Family Room area with sliders to exterior balcony. Plenty of closet space, 2-car detached garage, and newly landscaped front and backyard with lawn area and concrete patio. Also a small California basement which would be perfect as a wine cellar or additional storage. Must See!" "Introducing 7 new single family homes on a small subdivision lot. The homes offer space, light, privacy and best in class finishes in an unmatched location at the front door of Hancock Park. The three and four bedroom homes are contemporary in their architectural vocabulary and finishes. Living quarters feature 10 ft. ceilings, European White Oak floors throughout and gas fireplace. The open kitchen is customized with Snaidero cabinets, Caesar stone countertops and large pantries. Homes have a 2 car garage ready for electric vehicle and a generous roof lounge with soaring view of Hollywood Hills and Downtown." "Very nice Craftsman duplex in Korean town minutes away from Downtown Los Angeles. The front home has 4 bedroom and 2 baths and the back unit is perfect for an in-law home with 2 bedrooms and 2 baths. Assessor's office shows total of 6 bedrooms and 3 full baths but actual property has a total of 6 bedrooms and 4 baths. This property has a large lot with over 6,700 square feet and the total living space has over 3,000.00 square feet on both units. The property has all the potential and could be built up but needs some TLC." "Private, light and bright 3 bedroom luxury home in brand new construction Park Lucerne Condos. Master suite w/ walk-in closet, en-suite full bath. 2nd & 3rd bd rooms generously-sized. Full wrap-around patio is private and secluded w/ lush green views. Located on tree-lined Lucerne Blvd in Windsor Village, offering choice of 2 or 3 bedroom residences. This sophisticated new construction is tastefully adorned in high-end finishes and materials, Bertazzoni Refrigeratr, Gas Range & hood,Dishwsr & Bosch built-in cabinet Microwave, recessed LED lighting throughout. A portion of the project was an existing building and has been completely renovated. Prices, inventory and terms are subject to change. Builder reserves the right to change square footage, plans, HOA dues and pricing without notice. Broker/Agent does not guarantee the accuracy of the square footage, lot size or other information concerning the conditions or features of property provided by seller or obtained from Public Records." "Brand new construction 32 luxury condos on tree-lined Lucerne Blvd in Windsor Village. Park Lucerne residences are nothing short of spectacular. Offering choice of 2 or 3 bedroom residences. This sophisticated new construction is tastefully adorned in high-end finishes and materials, Bertazzoni Refrigerator, Gas Range & hood,Dishwasher and Bosch built-in cabinet Microwave, recessed LED lighting throughout. A portion of the project was an existing building and has been completely renovated. Prices, inventory and terms are subject to change. Builder reserves the right to change square footage, plans, HOA dues and pricing without notice. Broker/Agent does not guarantee the accuracy of the square footage, lot size or other information concerning the conditions or features of property provided by seller or obtained from Public Record." "Brand new small lots subdivision single family homes consist of 1,550 sq ft with 3 stories of cozy,stylish California living amidst the lively energy of Koreatown.Residents will enjoy 3 spacious bedrooms, 2 1/2 modern bathrooms, garage parking for 2 cars and the comfort of Townhome/Condo living with minimal MaintenanceAssociation Dues. The 1st level is conveniently laid out to include the garage,carport & guest bedroom/bathroom, while the 2nd floor boasts a large living room & kitchenwith ample natural light from the floor to ceiling windows and attached private balcony. The open floor plan is an entertainer's dream & the stunning engineered white oakhardwood floors add a relaxed Southern California vibe.The kitchen & bathrooms feature top-of-the-line,brand new Bosch appliances and elegant designer finishes. Eachhome has cool energy-saving NEST Learning Thermostats.On the third level you'll find an oversized master bedroom and ample guest bedroom with bonus office/nook." "QUIET + PRIVATE. INCREDIBLE VALUE. This 1923 Craftsman Bungalow sits 2 stories high on maturely-landscaped grounds in Wilshire Park HPOZ. This impeccably-maintained 4 bed, 2 bath house is ready for your personal touch to cater to your family's needs and already boasts a backyard oasis with many fruit trees. Just a stone's throw away from Hancock Park, take advantage of nearby conveniences like The Wiltern Theater, CGV Cinemas, H Mart, Ralph's, Olympic Spa, The Wilshire/Western Metro stop, CVS, and Galleria Market in this centrally-located family-friendly neighborhood. High block wall w/ mature hedges insulate property. 2nd bedroom downstairs is currently used as a den. This is a must-see! Property to be sold AS-IS." "Great Penthouse corner unit,face south / west , 3 bedrooms + loft ,It is a beautiful condo. This unit's layout is an open concept with a modern style kitchen connected to a living area. The 2nd bedroom has access to a balcony. The community has gym, conference room and dual elevator. This unit is conveniently located within a few city blocks to bank,bar, fabulous restaurants, markets and entertainment. The security guard hours is from 11 pm to 5 am." "Located in the desirable Windsor Village. Walking your dog at Harold Henry Park and take advantage of nearby conveniences like The Ebell Theater, Marchiano Art Museum, Shops & Restaurants in Larchmont Village, The Wilshire/Western Metro stop, CVS, and Galleria Market in this centrally-located family-friendly neighborhood. Remodeled impeccable interior design. Modern, Elegant, and Luxurious styling through out. Open floor plan with high ceiling, recessed lights, fire place, high quality engineered wood floor, new kitchen counter top and cabinetry. Features are two separate bedrooms with their own bathroom. Generous master suite features walk-in closet, private balcony, spacious master bath with jetted tub and separate shower room, double vanity.No shared walls, very quiet and private unit." "Top floor condo available with open floor plan and full of natural light! Brand new construction 32 luxury condos on tree-lined Lucerne Blvd in Windsor Village. Park Lucerne residences are nothing short of spectacular. Offering choice of 2 or 3 bedroom residences. This sophisticated new construction is tastefully adorned in high-end finishes and materials, Bertazzoni Refrigerator, Gas Range & hood,Dishwasher and Bosch built-in cabinet Microwave, recessed LED lighting throughout. A portion of the project was an existing building and has been completely renovated. Prices, inventory and terms are subject to change. Builder reserves the right to change square footage, plans, HOA dues and pricing without notice. Broker/Agent does not guarantee the accuracy of the square footage, lot size or other information concerning the conditions or features of property provided by seller or obtained from Public Record." 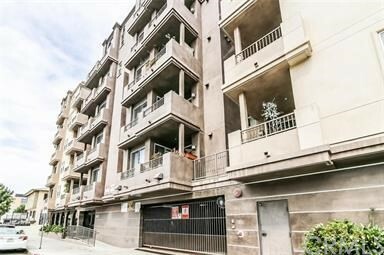 "One of the well maintained condo in heart of Mid Wilshire-Korea Town. This unit has spacious open floor plan, custom built cabinet, balcony. The community has recreation room and gym. The condominium is located on the most sought after area in LA. lots of restaurant, bar, market, public transportation are within walking distance." "It is a convenient and beautiful condo built in 2008 and the most desirable location in Korea-town.This airy south unit is modern, bright inside and open floor plan. It has 3 bedrooms and 2 bathrooms with high ceiling. Private balcony allows you to see the great city view! There is a private laundry room with washer and dryer in the unit. A secure gated 2 car parking spaces. The community has gym, conference room and dual elevator. It is just a few blocks from market, bank, bar, fabulous restaurants and entertainment. Close to shopping & downtown LA, Hollywood and Beverly Hills. Much more. MUST SEE!!"